With justice elusive over the past year and a half after the alleged torture, this incident is set to change how the minority, not just in Nerella but also in Sircilla, vote. Last week, as KT Rama Rao was addressing a public gathering in Thangallapally, Sircilla, which is his constituency, Kolla Harish made his way towards the venue of the event, clutching a bottle of kerosene in his hand. Harish, one of the victims of the Nerella incident, where eight Dalit men were allegedly subjected to third-degree torture by the police, was ready to kill himself in front of the incumbent Minister. A day after the incident, he and another victim Penta Banaiah met with TNM in Sircilla and spoke about the alleged custodial torture they underwent and how justice is still a far cry. “We have had enough of being slaves to these powerful people. People of our village are living in fear. But with elections around the corner, we are going to give them our response through our votes,” he adds. Justice has been elusive over the past year and a half as the victims continue to fight against the atrocities they were put through. And with the state going to polls on December 7, this incident is set to change how the minority, not just in Nerella but also in Sircilla, vote. The Nerella controversy began a year and a half ago after a sand lorry hit and killed a local of Nerella village on July 2. With several such deaths occurring over the past few days, there was massive anger among locals, with some of them torching a sand-laden truck as well. Following this incident, the police detained eight Dalit men from the village for allegedly torching a sand-laden truck. Narrating their version of the story, Banaiah says that nearly 2000 lorries would move up and down the area, sometimes leaving hardly any space for other vehicles to pass. And this had caused several accidents. “There have been incidents where nearly 12 people in a rickshaw died in an accident caused by the lorry. Every day there is a death. And the lorries too are not legitimate. Nearly 10 lorries run with a single number plate. We once questioned them about this,” he claims. But with regards to the incident, where agitating locals burned down a lorry, they claim they didn’t have anything to do with it. “We only happened to be there. We went to see what was going on. But I think they were angry with us for questioning them earlier,” Harish adds. Harish, who was living in Karimnagar for the past three years had been preparing to become a constable. “After two failed attempts, I just cleared the constable exam. I had 15 days for the next round so I came back home to rest till then and this happened. Now my career has been ruined,” he adds. On July 4, 2017, SI Ravinder from the crime branch, along with 10-15 policemen allegedly came to their houses and detained them without even telling them why they were being taken. “They took us to some room where they stripped us down to our undergarments and chained us so we don’t run away. There was a window with railings, like the one you see here. They made us put our hands through that, tied our arms and weighed down our feet as well. They would lash us with rubber whips. One lash with that was enough for us to lose our senses. After a point, we couldn’t feel anything and eventually lose consciousness. They would also spread our legs and tie our feet to a chain from the roof, gag us and continuously hit us, while splashing water on us. Our arms couldn’t reach our feet so there was nothing we could do. They would also lock our feet on a wooden slab, tie our hands behind the back, gag us, then stand on our thighs and continuously lash us. We couldn’t even scream. Just tears rolling down our eyes as we experienced excruciating pain,” Harish says as he recounts the horrors they went through. They were also abused with caste-ist slurs. “They abused us saying ‘how dare you question the powerful men of Nerella. Don’t you know these are government lorries. Do you know these are TRS lorries?’ Only when they abused us did we come to know why we were detained,” Banaiah says. Harish claims this happened for four days after which they were taken to a court, but were allegedly warned not to say anything or face death. 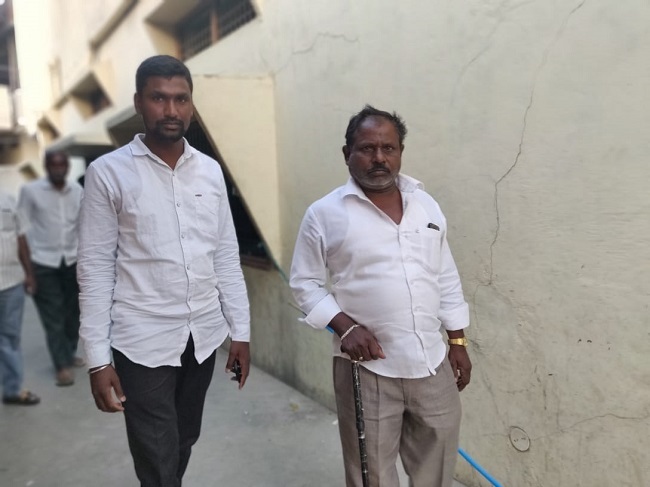 After that when they were taken to Karimnagar jail, the officials there noticed a limp as they walked and upon inspection came to know of the torture we were put through. Following this, few BJP leaders took note of the incident and got them admitted into a hospital, where they were treated for around a month. At this point, these eight men were let out on conditional bail. 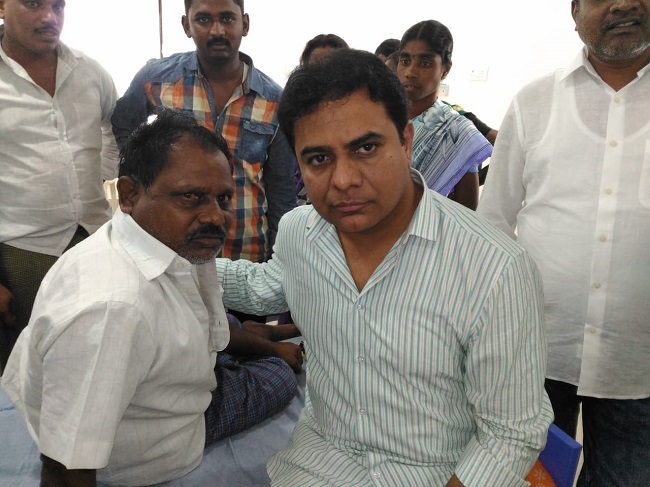 “This was when KTR visited us and said that he didn’t know of this earlier and now that he did, he promised to take us to Hyderabad to be treated, compensate us for the damage incurred and help us get jobs as well. But once he left that day, we haven’t heard back from him and till date we get threatened by TRS party workers to not question KTR,” Harish says. They then filed a case with the High Court, following which they were referred to NIMS hospital in Hyderabad. But Harish claims that they were kicked out of NIMS and later even Care hospital and had to eventually return to their village. Harish and Banaiah say that even today they have nightmares about the incident. Due to injuries from the torture, Banaiah limps and needs a walking stick for support. The police also allegedly passed current to their heads, because of which they have sensitivity towards bright lights and the hot sun, Harish claims. “The police are constantly watching our every move. We can’t go anywhere or do anything. KTR has done nothing for us till now. Even the development in Sircilla is a farce,” Harish adds. While eight Dalits were subjected to torture, six of them have now shifted their support towards TRS and claim that they have faith in KTR. But Harish and Banaiah say that they will continue to fight till justice is delivered and will not give in to money or fear. “If not for the Congress and BJP's help, we would have died by now. Why didn’t the TRS come to our support even once, if they weren’t at fault? If they did, I would tell you now that yes, KTR supported and helped us. But they didn’t. He doesn’t even come to Nerella anymore,” Harish adds. “We need justice and TRS will not deliver justice to us. We will vote for someone who will ensure we don’t live in fear,” Harish adds. Despite this anger, Sircilla still remains KTR’s bastion. He also enjoys massive support among locals for the development he brought to the town. Walk around the town and ask anyone, they will tell you who is likely to win this election season.